On this page, we provide some helpful tips for living climate-friendly lifestyles. Click here for a copy of our Steps for Climate Friendly Living brochure. Reduce – one of the best ways to make your cleaning easier is to have less stuff around. Bonus points if you get rid of power-sucking appliances, like that almost empty second fridge you have in the basement. Reuse – Rather than sending your stuff to the local dump, you might consider donating gently used items to a Thrift Store, put them up for sale at a garage sale or (if you are in Winnipeg) put them on the curb on one of the annual Giveaway Weekends. Recycle – Sustainable Development Manitoba has a list of Producer Responsibility Organizations (PRO) that recycle goods or dispose of hazardous wastes properly. Get organized – no need to go out and buy new products to store the stuff you do want to keep. Cereal boxes (cut diagonally across the front and back) make great magazine and paper holders, toilet paper tubes can keep your cords neat and tidy… The internet is full of organizing hacks that reuse items you already have! Clean your appliances – vacuum the dust off your refrigerator coils, clean the filters in your furnace and air conditioner, make sure there’s no ice build-up in your freezer that keeps the door from sealing properly. Your appliances are at their most energy efficient when they’re clean. Make your own cleaning supplies – avoid the toxins that come with many conventional products by following these simple recipes from Green Action Centre. Plus you can cut back on wasteful packaging by making your own at home. Ditch the disposables – use cloth rags that you can launder and choose a mop with a head that’s easy to wash and reuse. Fill your dishwasher rinse agent dispenser with white vinegar. Soak sweat-stained white clothing in about 60 millilitres of white vinegar and enough water to cover the stain. Leave overnight. Wash with eco-friendly laundry soap. Soak rusty tools in a pail of white vinegar and brush to clean. To deodorize your toilet, pour 125 millilitres of white vinegar into the bowl. Let sit 15 minutes. Flush. To remove hard water deposits on your tub/glass shower doors, heat 250 millilitres of white vinegar in a pot. Spray onto surface. Let sit 15 minutes and wipe clean. Thaw food in the fridge – Put that frozen turkey to work for you! Reuse the energy spent to freeze your food by using it to help keep your fridge cool as it thaws. You will also save on the energy needed to defrost the food item in an oven or microwave. Choose the smaller appliance – Smaller appliances use less energy. Many meals can be easily and efficiently cooked in an electric frying pan or toaster oven. Electric kettles are the best choice for boiling water. Keep the fridge closed tight – Test the door seal by putting a piece of paper between the door and the seal. If the paper falls down when the door is closed, your door needs to be corrected. Use lids – Unless the recipe calls for an uncovered pot or pan, always use lids to trap heat, speed cooking time, and save energy. Turn off – Once your food is cooked, the oven will stay warm enough to keep your food piping hot with the oven off. The same goes for food prepared on the stovetop. Cooked through? Keep it covered and shut the heat off. Air dry dishes – Prop open the dishwasher door and dry your dishes — without spending a cent! The warm, moist air will be welcome during dry winter conditions. During the summer, minimize the heat added to your home by running the washer during the evening and skipping the heat-generating dry cycle. Choose Cast Iron– Sometimes old solutions are the best way to go! Cast iron has been around since well… the iron age! Skip the teflon, and other chemically coated “non-stick” kitchenware, and choose this naturally non-stick, heat retaining, super durable option. For full care instructions, click here. Donate to organizations that promote climate solutions- Climate Change Connection is a program of the Manitoba Eco-Network and you can support our efforts to facilitate solutions to climate change in Manitoba with a tax deductible contribution through www.mbeconetwork.org. Give your gently used clothing and household items to a second hand store- The fewer new materials we use and dispose of, the fewer greenhouse gases we emit. Volunteer your time for causes that get people out of their cars, promote community, and call on government and industry to keep fossil fuels in the ground. Want to help out with Climate Change Connection? We need researchers and writers who can helps us keep our website up to date with Manitoba-specific information on climate change facts and solutions. Email climate.connection@mymts.net to learn more. Share news about climate change impacts and solutions on social media– You’ll have lots to choose from by following us on Facebook , Twitter, or Instagram. Choose creative alternatives to material gifts for any holiday season- Make a donation in someone’s name or treat your loved ones to a special experience. Find more great ideas here. Single-use plastics emit greenhouse gases as they’re produced, transported and disposed of. Here are some simple ways to use less. No straw please: If you don’t need a straw, remember to add these few simple words to your drink order next time you’re at the restaurant. Bring your own bags: If you always keep one or two in your backpack or your car or wherever they’ll be handy should you decide to do a bit of shopping, you won’t have to accept more plastic bags. If you like using plastic shopping bags for lining your garbage can or picking up pet waste, check out some of the alternatives. Buy in bulk: Buying larger quantities (even if that means freezing some food for later use or splitting an order with a friend) can reduce the amount of packaging you use. Some bulk food stores will even let you bring your own containers to fill up so you can avoid any new packaging entirely! Don’t drink from disposables: Carry a reusable water bottle and/or a travel mug with you so it’s easy to stay hydrated or get your morning cup of coffee without needing any new plastic. Choose soap and shampoo bars: You can eliminate the plastic bottles some of your bath and body care products come in by using bar soap. Shampoo comes in bar form too. Pick bars wrapped in paper or with no wrapping at all. Your local farmers’ market is a great place to shop for this! Take the Plastic Free July Challenge: Started in Australia, there are now people from 159 countries participating in this initiative to #choosetorefuse single use plastic. There are different actions you can choose, with lots of helpful tips and tools on their website. Our food choices can have a big impact on our carbon footprint. There’s the emissions from nitrogen-based fertilizers used to grow crops, the transportation of food from far away, the production and disposal of packaging – and that’s just to name a few examples! 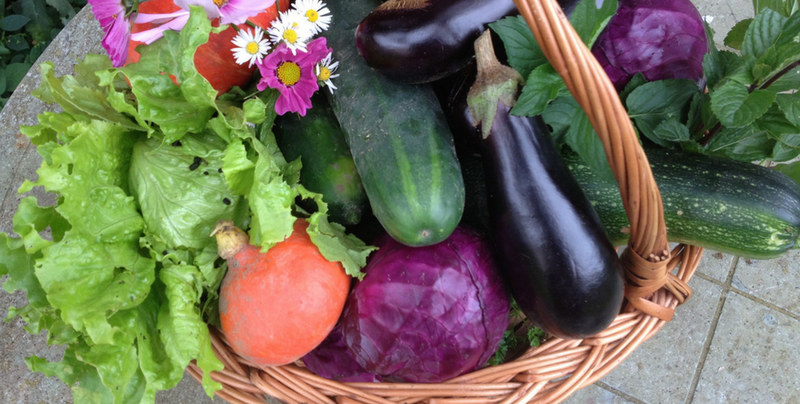 Grow some of your own food this summer to help make a difference. Plant what you like to eat: Just because all your neighbours grow tomatoes, if you or your kids don’t actually LIKE tomatoes, you may as well put your efforts into something that will taste more rewarding to you. Stagger your planting: The May long weekend isn’t the only time to add new seeds and transplants to your garden. Try seeding quick growing vegetables like lettuce every few weeks so you always have a small amount ready to harvest rather than a large amount all at once. Add some edibles to your flower bed: Kale or Swiss chard can look beautiful in amongst some blossoms while providing you with nutritious greens all season long. Or why not have some cucumbers vining up the same trellis that supports your nasturtiums? Keep the herbs close to the kitchen: If all you have to do is take one step out your door to snip off some basil or some thyme to add to your supper, you’ll be much more likely to make good use of the herbs you grow. Start small: Be careful not to bite off more than you can chew. A small area that is easy to keep weeded and watered can yield more than a larger area that is too overwhelming to get to very often. 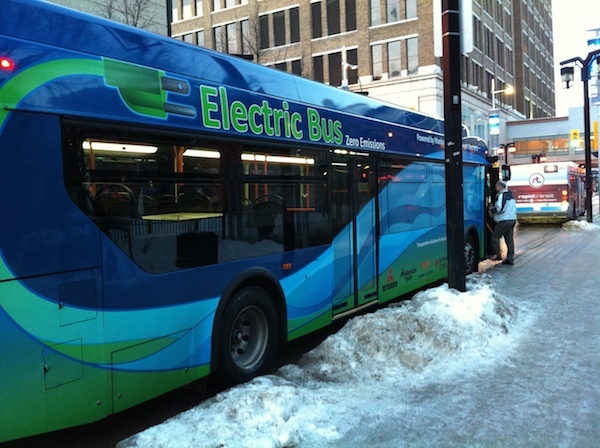 Individuals commuting by car is the largest single source of greenhouse gas emissions in Manitoba. Almost one-third of transport emissions come from cars, trucks and motorbikes. (1) For times when you can’t avoid getting in your car, here are some tips for greener driving. Plan your trips– Do you need to drive to the other end of town to get that snack right now? Is there some place closer? Could it wait until you shop for next week’s groceries? Organize your needs and plan your trips so that you can cover more of your requirements in one trip. Travel at moderate, steady speeds– Posted speed limits are not just for safety. They also represent optimal rates of travel that maximize vehicle efficiency. Increasing your speed on the highway by 10 KPH increases your fuel consumption by about 7 percent. Don’t idle– Check out our website section on Idling and avoid drive-through windows! Inflate your tires– Properly inflated tires are safer and they can save you money. Many people travel on under-inflated tires and don’t realize it. Modern radial and especially low-profile tires look perfectly fine even when they are significantly under or over-inflated. Check your owner’s manual for the correct tire pressure and use a tire gauge to measure it. Maintain your vehicle– A poorly maintained vehicle burns more fuel (and therefore releases more emissions) per km than a well-tuned one. Monitor your fuel economy. A sudden change may mean something’s wrong. Change your air filter, oil and oil filter regularly. Reduce, Reuse, Recycle – Don’t get sucked in by all the advertising. You might not need as many new clothes and school supplies as retailers would have you believe. If you have to buy new items, look for ones with recycled content. Pack a litterless lunch – Reusable containers, cloth napkins, a sturdy water bottle- make sure you have the tools to pack healthy lunches without creating any garbage. Join a walking school bus – Set up a pick up spot and enjoy the fresh air, exercise, laughter, and outdoors while getting to school sustainably. Leave the car at home – Take advantage of discounted bus passes from Winnipeg Transit, or save even more – money and greenhouse gas emissions – by biking and walking to school as much as possible. Get your community involved – Start school-wide travel planning, fundraise for a good cause or organize an educational evening. Food, glorious food! We certainly are lucky to have a vast variety of it. Yet watermelons in winter and almond milk come at a price to our environment. Here’s the 5 N’s to remember when choosing between the many food options. “Nearby”– buying food produced by local farmers greatly reduces the pollution created from transporting food all around the world. Find a nearby farmers’ market here, or reach out to your rural neighbours. “Naked”– choose foods with less packaging. Reuse produce bags to put in fruits and veggies, rather than picking pre–packaged mesh or plastic-wrapped foods. “Nutritious”– buy food that is raw or has low levels of preservatives. Not only are home-cooked meals better for you, they also reduce the packaging waste and factory pollution associated with prepared food. Baking and cooking don’t have to be complicated, and they sure can be fun! If you’re in need of some fresh tips, check out ideas and programs at Food Matters Manitoba. “New Now”– eat Canadian fruits and veggies at the time of year they grow, or grow your own veggies in your garden. Produce that is out of season in Canada has to travel extra far, contributing GHG emissions that are very avoidable. The environment will thank you for your patience when the juicy, delicious in-season produce arrives. Check for the right season here! “Natural”– choose food that is organic or low in pesticides. Every year the Environmental Working Group releases the “dirty dozen”- a list of the most pesticide-ridden produce on the market. There’s some pretty alarming scientific evidence demonstrating the health impacts of pesticides on us, animals, and the environment. 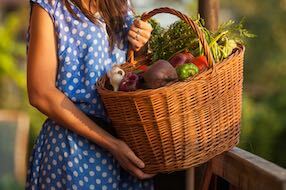 Skip the “middleman” and meet the producers that make your food, by heading to a farmers market. These feature comparative costs, plus you are supporting the locals directly. Plan your trips– Canadians waste 27% of the food we produce! To avoid throwing food out, take a peak in your fridge for things you already have, and make a list of food you need to last just one week at a time. Bring your own bags– Did you know that 3% of global oil use comes just from making single-use plastic bags that ultimately get left to degrade for 100’s of years? Wild! Especially when it’s easy peasy to bring your own bags. These are an inexpensive, and often free, investment that can be kept in your car, by the door, and in your backpack or purse. Reuse or avoid produce bags- Once you’re at home, take fruits and veggies out of their produce bags, and save the bag for next time. Better yet, skip them all together whenever possible. Wear one dress for a month- One Winnipeger decided to join the October Dress Project a couple years ago and in pursuit of ‘anti-consumerism, pro-simplicity, anti-conformity, pro-imagination.’ wear the same dress, every day, for a month. Why not give it a try, any month of the year? Try Project333- Pick 33 items of clothing, box everything else up for 3 months and away you go! Get instructions and tips for this challenge from the bemorewithless.com blog. Start off slow- If having a 3 month wardrobe with only 33 items is too hard, how about starting by getting rid of 33 items from your wardrobe. Check out this list of 33 things to eliminate from your closet – like yoga pants that don’t go to yoga or those super cute shoes you can’t walk in. Shop at thrift stores or hold clothing swaps- One person’s junk is someone else’s treasure. Don’t let good clothes go to waste! Learn to sew- Mend a small hole or replace a lost button instead of getting rid of a whole sweater. Choose organic- Synthetic fertilizer use is a significant contributor to climate change, so look for fabrics that are produced more sustainably. Read more about the differences between conventional and organic cotton production. Wash your clothes in cold and hang them to dry- These are two simple ways you can save energy. Program your thermostat- Keep your house a few degrees cooler when you aren’t home and at night. You can save 3 – 4% on your heating bill by turning your thermostat down 3°C for at least 8 hours every day. Draw the drapes- Blinds and drapes trap heat inside during cold winter nights, keeping you warm and more energy-efficient. Roll out a few rugs:- Laying rugs on cold floors – in the basement, the bathroom or even an attached garage – will help to insulate and make the floor (and you) feel warmer. You could even upcycle your old t-shirts into a fun do-it-yourself rag rug. Dress warm for the drive- Once a vehicle is running, the best way to warm it up is to drive it. You need no more than 30 seconds of idling on winter days before driving away. Find a place to plug in- Using a block heater is a more efficient and effective way than idling to warm your car’s engine. You don’t need to leave a block heater plugged in overnight to warm the engine. Set a timer. Two hours is plenty of time. Get out your winter bike- The right preparations can allow you to keep cycling all year long. Follow the link to read up on what to wear and how to outfit your bike so you can stay safe and warm on the road. Keep on choosing local food- Even if your garden is done, you’ll still find Manitoba-grown squash and root vegetables in the stores – perfect for making lots of soups and stews to warm you up this winter. Meat, grains, dairy and preserves that haven’t traveled far can be found year-round too. Follow the link to find out where to shop. Educate and train youth for green jobs- Adapting school curricula and providing scholarships and grants can help our economy shift to provide jobs outside of the fossil fuel industry. Encourage growth of the green energy sector- Tax-breaks, incentives and funding can help the development of green technology take off and provide more green jobs. Promote net-zero energy homes and electric cars- These promising technologies need the support of consumer awareness and incentives to take off. Support active transportation- The right infrastructure (like sidewalks and cycling paths) can encourage people to get out of their cars. Reduce food waste- Municipal composting programs, public education, and banning supermarkets from throwing our food are some effective tools. Rather than fly a speaker in to your next conference, invite them to share their knowledge and experience with you without getting on a (carbon intensive) plane. Here’s how Climate Change Connection hosted a presentation in Winnipeg recently with a speaker from out-of-province. Use one computer and one projector for the slides that your presenter wants to show. Load their presentation on this computer in advance and have someone assigned to advancing the slides during the presentation. Use a second computer and a second projector to show the presenter themselves through a video messaging app (e.g. Skype, Google Hangout, FaceTime, Facebook Video Chat). If this computer has a webcam, your presenter will also be able to see their audience. Have a second person assigned to calling the presenter on video and and sitting at this computer throughout the call. They should also manage the webcam, especially during a Q&A period, so the presenter can see the person asking a question. The key here is to make and test the connection and equipment with the presenter well beforehand. Use a landline phone connection to the presenter to provide the sound. For the best sound quality, you will want the presenter to be using a headset connected to their phone. You will likely need to amplify the sound to your audience with a public address (PA) system. This can be as simple as a microphone held near a speaker phone. Once you’ve connected with your speaker on the landline, mute the sound on the video connection. Manage the lighting during the presentation. 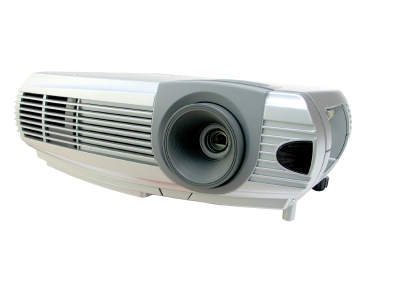 Lowering the room light while the presenter is speaking or going through their slides will make it easier for the audience to see them. You can have brighter lighting during a Q&A so the presenter can more easily see the audience. Test your setup and equipment beforehand to make sure everything is in working order! These tips come from the Green Action Centre submission for a Made-in-Manitoba Climate and Green Plan. You can read the full document here. Have a Plan- Just like long-term planning and strategic investments allowed our province to be powered by a low-carbon hydroelectric system, we can have a strategic plan for all sectors in Manitoba to become more efficient and reduce their greenhouse gas (GHG) emissions. Aim High- We need to set ambitious targets that- at the very least- do our province’s part in meeting Canada’s emission targets under the Paris agreement. We could encourage even more innovation with goals of going carbon-neutral or zero-emission in certain sectors or organizations. Get Ecofiscal- Tools like putting a price on carbon can encourage the things we want (like good jobs) and limit those we don’t (like GHG emissions). A carbon levy should apply to all sectors and the revenue be used to reduce GHG emissions or subsidize low income Manitobans affected by the levy. Plan for Green Transport- With a comprehensive transportation strategy, especially focused on getting people out of their cars in the Capital Region, Manitoba could achieve targets like Vancouver where over 50% of trips are made by foot, bicycle, and public transit. Buy Local- Encouraging the purchase of foods grown in Manitoba cuts down on carbon emissions from transporting food and promotes growth in our economy. Address Waste- We could create green jobs here at home in the collection and processing of organics and recyclables, while keeping these materials out of the landfill and reducing the significant part of our GHG emissions coming from waste. Travelling often doesn’t come cheap for you or the environment. Here’s some tips for greener travel. Stay close– People travel from around the world to see Manitoba and Canada overall. Before jet-setting around the world, check out some of the local sights that we are lucky to have right in our backyard. Hire bicycles instead of a car if you are exploring locally. Not only will this save emissions, you’ll save yourself some money too – and help to burn off any holiday excess. Local tourist centres have excellent suggestions of places to rent bikes and where to explore. Explore the natural wonders– check out the local hikes, outdoor sights, and walking tours rather than spending money and GHG on boat tours, quad expeditions, and shopping malls. Find an eco-lodge– these hotels, bed and breakfasts, and resorts get the full five-star approval from the environment. These green spots are absolutely beautiful, leaving a lasting imprint on you (but not one on the environment). If you are staying in a hotel on holiday, ask for your towels to be washed every other day instead of every day. Get outside this summer… biking, walking, flying a kite, playing a recreational sport, you name it! While this may sound obvious, it’s easy enough to get caught up in the daily grind, even in the summer. Make some time for yourself, family, and the environment by ditching your devices and seeking some real life fun! Explore by bike– No matter where you live in Manitoba, there are places to explore by bike. The Winnipeg trail system is growing every year, and leads to all kinds of cool places. Plan your next bike adventure with these awesome maps and these great tips. Plan a picnic– With the help of a loved one or young’un, plan to walk or bike to a nearby park. Pack some tasty in-season fruit, homemade lemonade, and a frisbee to add some fun! Help the bees- Whether you’re a seasoned gardener or interested bee-saver, there are many different ways that planting a simple flower or fruit tree can help ensure the bees are around for generations to come. Check out this list of bee-saving plants (pages 22-27) that can be added to your yard. Go to the [outdoor] movies- If you need a relaxing night, but also want to spend some time outside, Movies on Memorial is an excellent choice. Every Tuesday in August, people gather from far and wide to sit under the stars and watch free family favourites in Memorial Park. Embrace the warmth- Manitobans endure some of the coldest months to finally enjoy the heat! Embrace this, and turn down the air conditioning to a manageable temperature.Turn it off if you’re not home during the day… it just takes a few minutes to cool the house down once you return. Big fan of fans– Better yet, ditch the air conditioning altogether! Stand-alone and ceiling fans also do an excellent job of cooling down the house. Close your blinds and windows during the day, and open them at night when there’s a cooler breeze. This method allows your house to naturally cool itself down, without the need for extra energy. Reusable water bottles- Keeping a couple reusable water bottles in the fridge ensures there’s cold water on hand to keep you cool. It works as a cool compress while also reducing the need to run the tap or buy plastic water bottles. Celebrating the season doesn’t have to be all about shopping, shopping and more shopping. Here are some low(er) carbon ways to show your love. Start close to home. What do you have in your life that brings you joy? Some favourite recipes you could copy out for a friend? A house plant that you could take a cutting from and pot up as a gift? Some family heirlooms you can pass on to the next generation now? Think outside the box. Introduce someone to a new author by signing a book out of the library for them. (It’s a gift there’s no shame in returning!) Sign someone up for a gift that could last the entire year – or at least a few weeks, like a pottery class or a membership with one of the Manitoba Eco-Network member groups. Get cookin’. Edible gifts can be a good way to go. How about some homemade frozen dinners for a busy family to heat up when they need a ready made meal? Or a batch of sweets made with local flour and fair trade chocolate chips? Be generous. According to a poll by CanadaHelps and Ipsos Reid, 59% of Canadians prefer to receive a charitable gift rather than a traditional gift. Plus, there are so many great causes working to reduce carbon emissions and help communities here and abroad adapt to our changing climate. Donate time or money in honour of your loved one. Spend time together. Go for a walk or a toboggan, a skate or a swim, hold a family talent show or a costume party. Build or cook together. Teach each other about things you’ve learned this year. There are so many creative possibilities for strengthening relationships and giving the gift of acceptance and belonging during these longest nights of the year. Share some love with our one and only… Earth! Make Time for your Love – Most of us don’t need more stuff and the more stuff we buy, the more greenhouse gases we emit. Skip the tangible gifts and spend time together with those you love. Share the (Recycled) Love – There are lots of creative Valentine’s cards you can make from recycled materials. Try turning newspaper or some fabric scraps into handmade valentines with the kids in your life. Love the Journey – If you’re headed out for a date night, how you get there is half the fun! Leave the car at home and bundle up to get there on foot. Or let the transit driver deliver you to your destination so you can cuddle up with your sweetheart at the back of the bus. Love the Dark – Turning off (most of) the lights not only creates a romantic ambiance, but it saves you energy too! Love Your Neighbourhood – Get outside to appreciate the beauty of our environment – whether that be sunshine sparkling on snow, the criss-cross of bare winter branches against a bright sky, or the sound of kids playing down at the hockey rink. We protect what we love so make time to keep falling in love with the world around you. Avoid the Peeps– Whether you’re a fan or not of these marshmallow mysteries, try to avoid the “cheep” candies that may appear cute, but come with lots of packaging. Choose a bulk candy option instead, and reuse the plastic bulk bags later. Choose Fair Trade Chocolate– Not only does this chocolate taste richer than conventional alternatives, it also supports sustainable business practices around the world, ensuring that workers receive a fair wage. Dye Local Eggs– If you’re in the market for dying Easter eggs, try out local or free range brown eggs! While white eggs are often the go-to choice, dyed brown eggs result in deeper colours that are truly magical. Plus, what’s more special than feeling great about supporting sustainable farming practices? Opt for Meatless Meals– Whatever the celebration, traditional or not, why not try switching up the meal to a meatless option? Spring pastas, vegan quinoa stuffing, and cauliflower steaks might just become new family favourites. What could be scarier than climate change? As 350.org points out, trick-or-treaters and climate activists have a lot in common: “both aim to organize door to door from the ground up, they enjoy telling the story of a cause or concept through artistic expression, and they look GREAT in orange.” So why not pick a climate themed costume this Hallowe’en? Here are some ideas. Alternative Energy- Cover a big cardboard rectangle in shiny plastic with a grid painted or taped over top. Strap it on and you’re a solar panel. Dress in white and tape 3 long cardboard arms to your hat and voilà! You’re a wind turbine. Get your friend to dress as the sun or the wind and let the world know there are cleaner ways to power our future. Fossil Fuel Divestment- Here’s a clever one that 350.org came up with. Dress like a dinosaur or represent a fossil fuel any other way you like. Then get a vest and take it off anytime anyone asks what you’re supposed to be. Read up on the divestment movement at gofossilfree.org so you can chat with people about why fossil fuels are not a good investment. The Lorax- Dress in orange and make yourself a bushy yellow mustache. Now you’re ready to speak for the trees along with this famous Dr. Seuss character and let the world know how important forests are in slowing climate change. 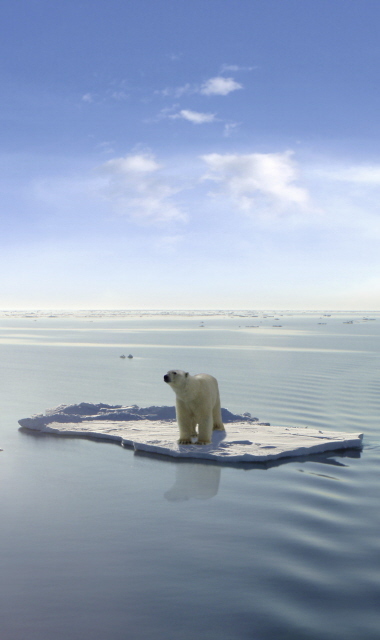 Skinny Polar Bear- They’ve become an icon of the climate movement. As sea ice breaks up earlier and earlier in this warming world, the bears’ hunting season is cut short leaving them underfed and in poor health. A white sweatsuit and some bear ears on a headband gives you a chance to tell their story. Browse the sidebar_widget archive. Bookmark the permalink.